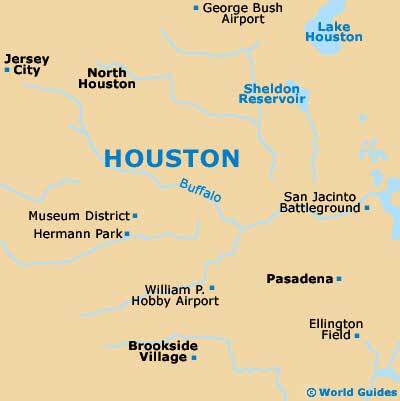 Houston is easy to reach by air and nearby George Bush Intercontinental Airport is roughly 40 minutes away by road. Handling more than 3.5 million passengers every single month, the airport dates back to the middle of the 1960s and now ranks amongst North America's busiest and fastest growing. Annual aircraft movements have now topped 500,000, with roughly 800 departures each day. Expansion plans have seen the building of new terminals over the years, to cope with the constantly increasing demand. In 2011, a non-stop flight to Lagos (in Nigeria, Africa) commenced, being offered by Continental Airlines. 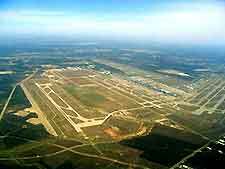 The George Bush Airport lies just 22 miles / 33 km to the north of central Houston, where it has become one of the largest air facilities in Texas. Nearby points of reference include the North Belt Intercontinental Business Park and the Lochinvar Golf Club. George Bush Airport contains five large terminal buildings, serving a mixture of prominent domestic and international airlines. The George Bush Airport is within comfortable reach of Houston city center, being connected by a number of major highways and busy roads. These include the Interstate I-45, Highway US-59, the Hardy Toll Road and also the Sam Houston Toll Road (Beltway 8). With two main entrances - on the John F. Kennedy Boulevard and the Will Clayton Parkway, the journey into downtown Houston lasts around 40 minutes, depending upon traffic levels and the time of day. Book your Houston IAH Car Rental here. Regular buses are operated by the Houston Metropolitan Transit Authority (METRO), collecting passengers from Terminal C and traveling into both the city and surrounding areas of Fort Bend, Harris and Montgomery counties. An increasing number of shuttle buses are also available, suiting short trips to hotels and other specific destinations. Taxi ranks are situated on the southern side of Terminals A, B and C, and also on the western side of Terminal D. Reasonably priced, cabs are plentiful and operated by many reliable companies, including the Fiesta Taxi Cabs Company, Liberty Cabs and Yellow Taxis. Of note, late-night surcharges are applicable, while seniors can enjoy discounts of ten percent. Private limousines can be hired from the airport, by the hour, and provide a particularly stylish way to reach your hotel. Limousines can be booked in advance, or from the information desks located within the ground transportation center.